Many people associate winter with being the most dangerous season when it comes to driving. And in a way, they’re right; the heavy snow, the dark days, and the icy roads spell trouble for even the most experienced of drivers. But what not a lot of people know or talk about is that autumn actually comes with its own set of hazards. Read on, and we’ll show you how you can protect yourself and stay safe on the road — so you can make it home in time for pre-Thanksgiving festivities and a hot cup of cocoa. Autumn is synonymous with falling leaves, and those that fall on your car will likely find their way under your hood, in the tray-like area below your windshield. The bits of leaves can collect moisture, and cause water to drip and seep into your car’s electrical system and damage your engine. So before you hit the road, do a quick check under the hood to make sure everything’s clean and clear. Your battery and the cold air don’t exactly go together. Research says that at 32°F, your car’s battery loses around 35% of its strength — which explains all those chilly mornings your car wouldn’t start, or cold afternoons when you found yourself stalled at the side of the road. Good news is, preventing this is as easy as replacing three-year old batteries with fresh ones. Before driving on roads slick with autumn rain and ice, make sure your tires have sufficient tread and pressure. Colder temperatures can cause the pressure in your tires to drop, which could lead to a blowout on the road. Tires with insufficient tread, on the other hand, can cause your car to skid and hydroplane. To check if your tires are okay, do a quick penny test: place a penny between the tread ribs of your tire with Lincoln’s head touching the tire; if you can see his entire head, it may be time for a four-wheel replacement. Did you know that leaves on the road can be as dangerous as standing water? Loose leaves can be slippery, especially when wet from the rain and moisture of the autumn air. So if you can’t avoid driving over them, at least avoid accelerating or braking. 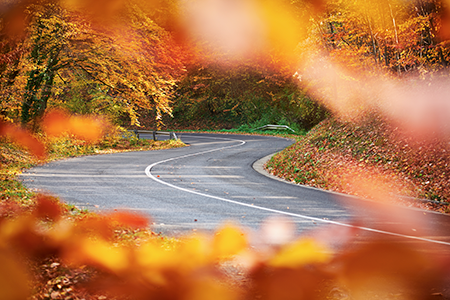 Slow down before you hit a patch of wet leaves — aside from keeping your car from skidding, you’re also protecting your tires from potholes that could be hiding beneath the orange foliage. November is mating season for deer, meaning you’re most likely to see them crossing the road than any other time of the year. Avoid a nasty accident by driving more carefully through wooded areas. The sun is closer to the horizon during fall, meaning glare on the windshield is a real problem for motorists. To help keep your vision in check, always keep your windshield clean and replace wiper blades when necessary. Be prepared by having sunglasses handy, and slow down or stop when the sun becomes too bothersome. Of course, the best way to prevent accidents is to have professionals regularly check your vehicle. Let King Brothers help keep you and your family safe in your car this season. Give us a call at 313-534-8090 (Redford) or 734-744-8557 (Livonia), or feel free to request for a quote here.